Conclusion – Is The Behringer B-2 Pro Right For Your Church? When you’re looking for a high-quality recording microphone, you need to make sure that it has all of the features that you need. Condenser microphones are generally going to be the optimal purchase to make. They have the right sensitivity to help you to pick up softer noises. This will allow you to record the little vocal intricacies that some other microphones will not be able to recognize. Also, a good condenser should be able to help you to record acoustic instruments with the best results. If you are planning on recording acoustic guitar, piano, or other types of instruments, then it makes sense to buy a top-tier condenser microphone. Your concern might be that purchasing a professional-grade condenser microphone will not fit into your overall budget. You’ll be happy to hear that this doesn’t have to be the case. 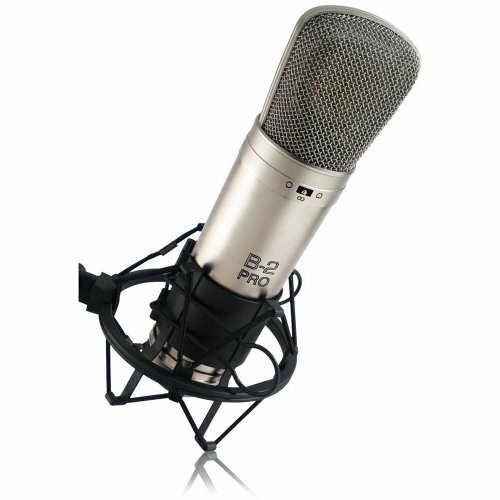 The Behringer B-2 Pro is a fantastic condenser microphone that is available at a very cost-effective price. This is a dual-diaphragm condenser microphone that is perfect for the purposes of recording. It does have some live applications as well but it is mostly going to be useful in the studio. If you need a microphone that can help you record the best audio, then you’ll want to continue to look into this product. As you would likely expect, this type of microphone is going to appeal to anyone who needs to record audio. The biggest demographic that will be purchasing a professional-grade condenser microphone such as this will be musicians. They will be able to use this as either a primary or secondary microphone in the studio. It is priced so reasonably that many people will be able to consider buying multiples if they have a great need. Touring musicians can also make use of microphones such as this for helping to mic up instruments. It can make for an excellent overhead microphone and will work well with a piano setup. It can be used in many different fashions so you can see how musicians would love having this type of microphone. It isn’t just for professional musicians, though. A good microphone such as this can also appeal to people who are recording audio for other purposes. If you like to record podcasts or if you need to narrate an audiobook, then having a microphone such as this will come in handy. People even use these types of microphones in churches sometimes for helping to record sermons to post online. There are many applications for this microphone and it is going to be a good purchase for just about anyone who needs a condenser microphone. You’re actually going to be getting quite a bit inside the box if you decide to purchase this microphone. Aside from the Behringer B-2 Pro microphone itself, you will also receive a carrying case, a windscreen, a shock mount, and a handy user’s manual. The user’s manual is convenient for when you want to be able to look over particular information about the microphone. You should definitely hang onto it and should consider keeping it tucked away in the case if possible. The included case is very high-quality and will help to keep the microphone safe when you’re transporting it. This will make it much safer to take the professional-grade microphone to other locations without needing to worry. It is made to be rather sturdy, though, so you shouldn’t be overly concerned. The included windscreen will help you to avoid microphone-popping issues to a further degree as well. Making use of the shock mounts should not be difficult either. You’ll be able to mount the microphone into place easily and it will give you the best experience possible. 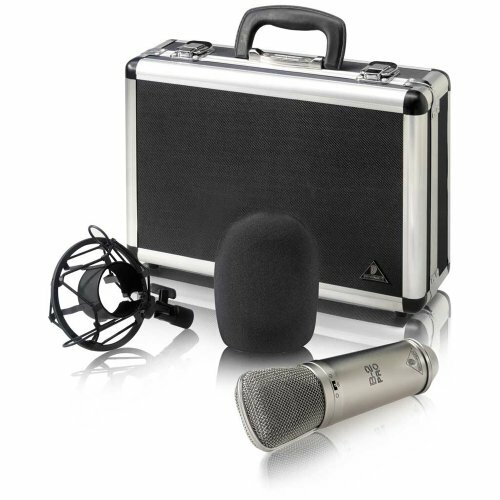 This is a great value with everything that is bundled with the microphone itself. It makes it a very convenient purchase to make. You can expect many fantastic features when you make the decision to purchase the Behringer B-2 Pro. It features a renowned cardioid vocal pattern that helps you to get smooth audio. You can select other great vocal patterns as well such as omnidirectional and figure eight. Whatever vocal pattern you choose will work very well. You can also make use of the switchable low-frequency roll-off and input attenuation features. You can really get superb audio quality when you use a microphone such as this. It will pick up sounds while eliminating any residual feedback noises. You won’t have to worry about having problems with isolating audio so much so it makes it simpler to get the sounds that you want while recording. You’ll get better results and have an easier time making things happen. It should also be said that this condenser microphone has a tough nickel-plated body. If you make the decision to buy this microphone, then it will be able to truly stand up to years of use. You won’t have to feel so concerned about it dying out on you after a few years. It can be a workhorse for you in the studio and it can stand up to the rigors of touring as well. One alternative condenser microphone that you may wish to look into will be the AKG Vocal Condenser Microphone. It has similar specifications to the Behringer B-2 Pro and comes in at a similar price as well. This doesn’t have the same selectable vocal patterns as the B-2 Pro, though. You will have to be comfortable with making use of the cardioid vocal pattern if you choose to purchase this. 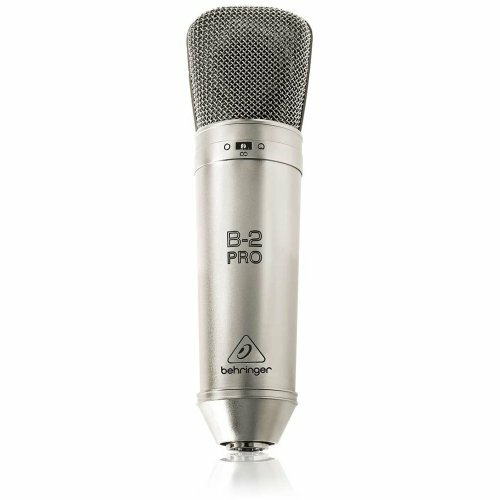 If you really need a high-quality studio condenser microphone, then you will want to take a look at the B-2 Pro. There are alternatives on the market that are similarly priced but you will be able to enjoy many amazing features with this particular mic. It has great vocal pattern features and gives you clear audio every single time. Your recordings can turn out amazingly if you use this mic to its full potential. Being able to own a sturdy condenser mic that is fully featured will be a benefit to many people. Whether you are a professional musician or you need a microphone for Sunday services, this will appeal to you. Simply purchase it and you can have a better recording experience. It is cost-effective and will definitely make getting high-quality sound simpler than it would otherwise be.